The Lord takes pleasure in His people – I Am Not Ashamed Of The Gospel Of Christ! There are more than enough people who do not fear God nor regard His goodness and power in the earth,but for those who do His will the Lord is well pleased! (Psalm 147:11), 11 The Lord taketh pleasure in them that fear him, in those that hope in his mercy. (Psalm 149:4). 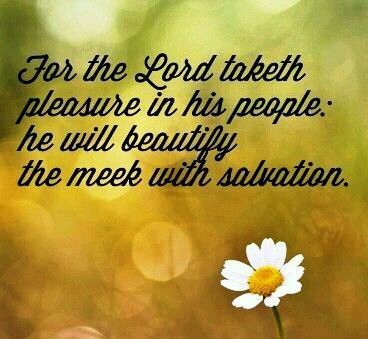 4 For the Lord taketh pleasure in his people: he will beautify the meek with salvation. Is it safe to say if we do not have faith that God has no pleasure in us?Scripture teaches that without faith it is impossible to please Him,and He has no pleasure in one who does not live by faith! (Hebrews 10:38-39), 38 Now the just shall live by faith: but if any man draw back, my soul shall have no pleasure in him.39 But we are not of them who draw back unto perdition; but of them that believe to the saving of the soul. (Hebrews 11:6). 6 But without faith it is impossible to please him: for he that cometh to God must believe that he is, and that he is a rewarder of them that diligently seek him. WilliamMorrison……It is always good to know that no matter what our Father in heaven takes notice of us trying our best to do His will.It was so good to hear from you again,may God Bless and keep you in His peace. Very beautiful, Julia. God bless you.